Open Car Show. Cars, Trucks, and Motorcycles All Makes and Models Welcome. PRE-REGISTERED AUTOMOBILES ARE ALSO ENTERED IN SEPARATE $100.00 DRAWING. $500.00 CASH DRAWING DURING AWARDS CEREMONY. Pre-Registration $20.00. Pre-registered receive goody bag, which contains t-shirt and dash plaque. First 150 receive dash plaque. Deadline to pre-register is June 15, 2019. Quads Rods & Customs - Barney Fest 2011 12th Annual Car Show Highlights from Curtis Edwards on Vimeo. 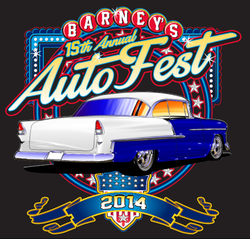 QUADS CAR CLUB, BARNEY’S AUTO FEST NOT RESPONSIBLE FOR ACCIDENTS, THEFTS OR DAMAGES. WE RESERVE THE RIGHT TO DENY ENTRY TO ANY PERSON(S). NO ALCOHOL. Monthly Club Meetings are the second Thursday of each month at 7:00 pm.